Share Your Candling Pics and Videos! 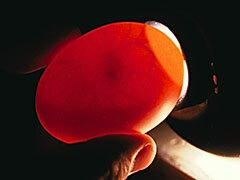 Discussion in 'Incubating & Hatching Eggs' started by hokankai, Mar 3, 2013. This thread is for us candling junkies to share our pics, videos, experience, as well as ask questions! I LOVE candling. Every egg is unique, and even though I've hatched eggs several times the novelty has not worn off. I just can't get over the fact that it feels like you're peeking inside of a womb, but then again I'm a huge biology nerd. Here are a few of my favorite candling moments. Day 14, this chick looks almost transparent! The objective is to hatch eggs, not to make a motion picture. Can you imagine if in the middle of the night & your sound asleep, someone comes in, shines a bright flash light in your face & yells Fire? What do you suppose your reaction would be & what do you suppose happens to your heart? What your doing is encouraging people to something that is completely destructive, so you can put it on Facebook? You do what you want, but don't encourage others by implying it's OK. ---It's not. Um, these are the candling landmarks... I candle around day 3 as a preliminary fertility check, day 7 as a final fertility check and mark the air cell, day 14 to mark the air cell, and day 18 to mark the air cell and check for viability prior to lockdown. When I see something cool I record it, I see no problem with this. No need to be rude and abrasive just because someone does things differently than you. I am a scientist, and therefore I enjoy taking notes and videos and my friends enjoy seeing them too. As you can see each video is no longer than 30 seconds. I have my phone in there with me to record weights, and these videos are accumulated over an extended period of time. Again, if you don't like it, move on. It may have been rude & abrasive, but I got your attention, didn't I. If you are truly a scientist you should know that you don't encourage people without your expertise to do things that can be detrimental to the development of a growing embryo Most of the post on here are from people that want to know how to candle or what they should look for. Candling to see a heart beat or to see them wiggle is TOTALLY unnecessary & to give them the idea that is what they should be looking for is , pretty much, poor advice. Take your pictures, post them on here, just do not encourage others to attempt to do the same. It may be "Fun" for you & your friends, but it could just as well be a disaster for someone without your experience, especially when their results could be a bunch of dead chicks. If you read the first sentence I also mentioned it is a place for questions to be asked and answered. People post questions all the time asking what they should be seeing, is this correct, etc. I never encouraged anyone to do anything, merely post pictures and videos that they've taken in the past. Maybe I'll put a disclaimer in the first post later today. Too annoying to do on a phone. A disclaimer would be great. Something like "Don't try this at home"
Well I suppose I have a little more faith in people's ability to make wise decisions. At any rate, thanks for your opinion. Thanks for the faith! I for one am thrilled about this post! What a great way to learn from one another. So here is my question! I'm new but feel like I have done my research extensively and am finally getting my hands on experience. We have set 28 eggs, they have been in the incubator for 84 hrs. So we did our first fertility check and we are also monitoring the air sac to determine humidity levels for this week. But being new I am having a hard time locating the air sac??? Maybe my eggs are too dark? From all the pics I have seen the sac is at the top and the embro mass is more central. Everything we have going on is all at the top. Any advice would be appreciated. RIR above- is that the ring you don't want to see? Ah, the problem I see is that you're candling at the bottom (pointy end) of the egg. The air cell is at the other end and should look like a little bubble. That is where I hold my flashlight to candle, right over the air cell, to get the best view of the egg's contents. So far those eggs look great! I'm assuming you are incubating them in a turner or cartons in the upright position? If so then this is completely normal, as the blastoderm floats to the top and likes to plant itself right under the air cell. That red mass is the start of the cardiovascular system, or what I like to call the blood island. Soon you will see distinct veins! Awesome! Thank you! Well I feel silly for doing it at the wrong end but like I said, getting my hands on experience here! And yes I have them this way in the turner, so I assumed this was the way you'd candle.